There's great excitement here at the moment, my first slipper orchid, bought two years ago at the Welsh Orchid Festival, has decided to form a scape. From peeking out between the centre of the top leaves, it has now grown into a fully opened flower! 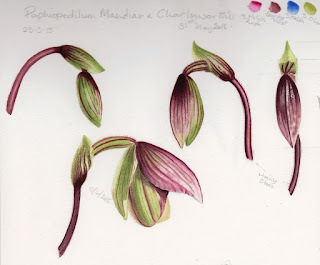 This has happened rather more quickly than the original flower when I bought the plant, so I've been hard at work recording the different stages in my sketchbook. Since I bought a tiny tube to try, I've been amazed at the versatility of this wonderful single pigment colour which reduces the need for mixing and gives me a deep colour with plenty of chroma and life to it, so I'm very happy to have a project that will make use of this wonderful transparent pigment. What colour/colours have you found you can't live without? 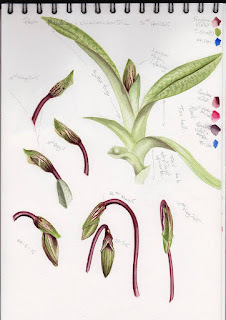 Polly, Your sketches are beautiful, and its so interesting to see the stages of the developing flower. I hope the flower lasts a long time for you so you can take full advantage of this opportunity to record it. As far as my favorite pigment goes, I guess it changes for each painting. In general, I love the Quins because of their strong, clear colors.